We are always under the influence of what we’re reading. From author Mary Pierce Brosmer…this morning. Yesterday I was compelled to get her book …. We all know how that works. … This time, I actually sat down and began reading–for most of the day yesterday, and more today. Good stuff! I’m feeling inspired and re-energized and reminded again that I’m passionate about women writers and gathering women to read together and share their stories–find their voices and courage–and re-story and transform and free so many confined places inside. 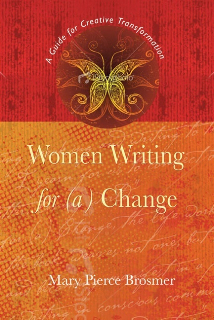 The book is Women Writing for (a) Change … wonderful stuff … so blessed with a space where women gather. Liking and just finishing this one. Flight and travel terms (i.e. ‘baggage’ … and do not to be carrying somebody else’s) and how to be living from our heart and spirit instead of traditional business and ‘how-things-work-in-the-real-world’ –that don’t for us. Energy sensitives and our feminine spirits don’t work this way. We have inner resources to tap–this is a how-to book for some of that. And we know we feel best when we are in harmony with our surroundings and work and people around us. Traveling-at-the-Speed-of-Love Tuesday nights Personal Renaissance Calls will switch to this resource starting Tuesday, February 17. … Now included with your Everyday Goddess Community memberships. RSVP. 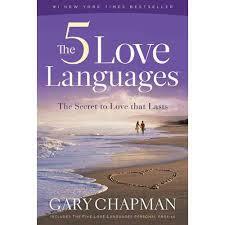 5 Love Languages by Gary Chapman is a third book I’m reading right now. Not usually what I pick up–except that it beckoned–several times. So I picked it up and started reading in the aisle–and then gifted it to my husband. No, not as a hint! Michael is a Science of Happiness teacher through Hapacus. And one of their and his special interest areas, is relationships. Anything ‘brain-science-related’ he’s drawn to, he reads and takes notes on–and this looked like something he’d find interesting… He did–and then said I needed to read it so we could talk! From the parts I’ve read so far, it’s fascinating and great significant-other material to share and talk about. 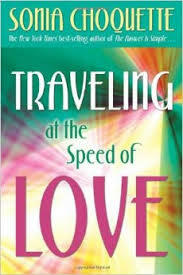 Here’s to February and love and Happy Valentine’s Day … and writing and traveling at the speed of love. What are you reading and under the influence of?